CLICK HERE TO SEE THE PHOTO GALLERIES. Today was the best thankyou for coming to our school we LOVED it!!!!!!!!! We loved our puppets. They were terrific! Thank you for helping us make them. Also, thank you for your funny puppet show. We loved being squirted with water from Jason. Thank you for helping us to make puppets. The puppets we made were really awesome! We love our puppets and we had lots of fun making them. Prep S, Lynbrook Primary School. My daughter Serena loved the puppet workshop run at Footscray West. She was very happy to see her creation on line, along with all her friends puppets. She also loved the show you put on. Thank you SO much for the amazing puppet workshops yesterday. 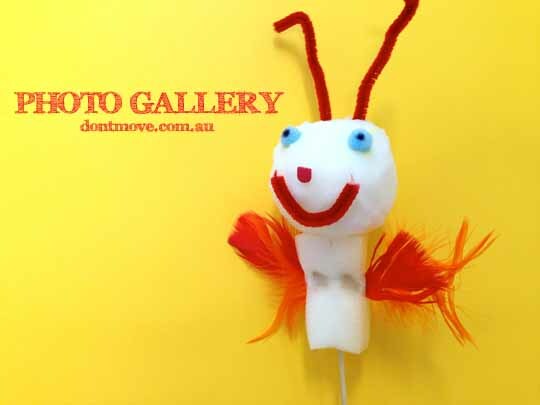 You helped us to create some fantastic puppets in such an EASY way. You were professional and worked incredibly well with the kids so they could be successful in making a special puppet. We also thoroughly enjoyed your show a couple of weeks earlier. It was so entertaining with your funny and interesting characters. We also loved your puppet theatre and learning about how you made it. Some of the students loved it so much they came to school the next day having made their own theatre! Love your work and will definitely be recommending you!